The hater: As part of Scottish art-rock act Franz Ferdinand, Alex Kapranos released four excellent records—including the brand new Right Thoughts, Right Words, Right Action—toured the world for 12 years, won a Mercury Music Prize and two BRIT Awards, and produced records for both The Cribs and Citizens! 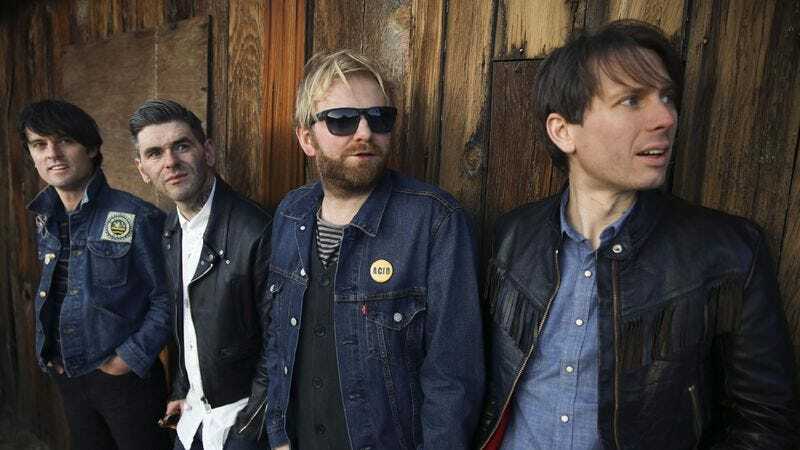 Kapranos has also penned his own food column, Soundbites, which detailed eating on the road for the Guardian newspaper and was released in book form as Sound Bites: Eating On Tour With Franz Ferdinand in 2006. The A.V. Club: Why is “Kumbaya” your least favorite song? Alex Kapranos: It’s a ubiquitous song that has been inflicted on so many people throughout their childhoods. When the idea of this interview first came through I thought, “That’s a terrible thing to do—to choose a song that you really hate. That’s such a negative thing to do.” But then I thought, “Okay, let’s think of some music that makes you just feel bad at the thought of the song.” So I was trying to think of what songs that fit that. Most songs, if you don’t like them, you don’t hate them. You just feel ambivalent about them. There are even a couple of songs from bands you adore. The Beatles are famous for having the odd song or two—“Ob-La-Di, Ob-La-Da”—that, well certainly for me, don’t excite me, but I don’t hate them. I just feel ambivalent about them. So then I tried to dredge through my memories and experiences of life and then, bang! Memories of “Kumbaya” hit me in my stomach like a pool of fresh vomit. I must have been a pre-teen because that’s when the song seems to have been inflicted on you more than any other time. AVC: Were you a Boy Scout? Why was it inflicted on you then? AK: I was a Cub Scout for a bit, yeah. You hear it everywhere, though. I heard it in Cub Scouts; I heard it in primary school. I remember having guitar lessons in primary school for a couple of weeks and music classes at school and “Kumbaya” was the sort of thing that would be sung. If you look at the melody itself, it’s not that terrible. It’s the repetition that really, really kills you. And I can’t remember where it was specifically, but I remember “Kumbaya” being sung and having an infinite number of verses. I don’t know if this was a common thing, or if this was some malicious childhood figure inflicting this—like a Cub Scout master or a primary school or Sunday school teacher, but they’d shift key at the end of every verse so it’d be like, “Kumbaya, my Lord,” and you’d get the same modulation you’d find in the tackiest of boy-band pop songs after every verse. It’s like drinking syrup; it makes you feel nauseous. It’s funny. After I picked this song, I was reading about it online and I noticed—and this is something I hadn’t realized—“kumbaya” has become a derogatory term for a simplistic and moralizing approach to a situation and the idea that something can be solved with a very naïve, positive attitude. I didn’t realize it had reached this cultural significance. But it triggered another memory of being a child and the memory of being patronized by adults. I think that song represents a presumption adults have that children are incapable of feeling any sort of emotional complexity and that’s reflected in both the lyrics and the music of the song. The melody is pure sweetness, there’s no contrasting emotion to make it convincingly human, and the overriding sensation I have listening to that song is that of being patronized by adults as a child. AVC: That’s probably part of the reason that “Kumbaya” has become this polarizing phrase. The song doesn’t seem like something that adults would sympathize with. It’s demeaning to them, and thus, so is the phrase. AK: I do think it represents the oversimplification of an event. I know it was a staple of the early folk revival movement and Pete Seeger sang it, didn’t he? While I have a lot of time for Pete Seeger and I think he was incredible in many ways, I feel that the folk movement did have an effective naïveté that turned me off. I don’t appreciate that in retrospect. AK: Just because of the naïveté of it? AVC: That, and he felt like a guy with a fur coat closet shouldn’t be talking about a lack of possessions. AK: Oh, yeah. I think he was one of the biggest landlords in New York at the time and he was telling people that they’d feel better with no possessions. I’m aware of that with that song, but for me, that makes it an interesting song because there is paradox. Usually what makes a song interesting to me is when things don’t quite add up and they don’t quite come together and I think that’s what “Kumbaya” is completely devoid. It’s nothing but glib positivity. AVC: When you were reading about the song online, did you come across how it used to be called, “Come By Here”? And at some point, it got changed to “Kumbaya” as an attempt to “Africanize” the song? AK: Yeah. This preacher claimed to have written it, yet there were recordings of it 20 years before he claimed to have written it. I can’t remember the names of the people involved, but maybe it represents a sort of disillusionment with religion that many people go through as they progress to adulthood from childhood. AK: Totally! It’s a very 19th-century concept isn’t it, the idea of the noble savage? I guess it came forward in 20th-century literature as well, where there’s this brave new world, but the guy who comes into the brave new world needs the noble savage. It’s so patronizing. To take somebody’s language and simplify it on our behalf is pretty repugnant. AVC: Nobody in Africa has ever said “Kumbaya,” unless they’re singing the song. AK: Maybe this something you find quite often in religion as well, but it’s a way of reinforcing your own sense of superiority that is pretty unappealing. AVC: You’re the first person to pick a standard or spiritual for Hatesong, so congratulations. It’s hard to believe no one’s chosen “Happy Birthday” yet. AK: I can’t stand that song! Whenever I have a birthday, I always request that it isn’t sung. Is there any good song about a birthday? Maybe the band The Birthday Party counts. I’d rather listen to the song “Release The Bats” by The Birthday Party. That’s probably a better way to celebrate. Do you think people hate the birthday song because you hear it too much as a child? AVC: It could be that, but it’s also a little anticlimactic. There’s never any passion behind it. It just seems obligatory and sad. AK: You feel obliged to sing it. That’s true and it’s weird isn’t it? A song like “Happy Birthday” is so celebratory, and there’s very little joy in the celebration of the music itself. AVC: You could say that’s what’s happened to “Kumbaya” as well. Since it was originally a spiritual, there’s supposed to be this deeper meaning in it, but because you hear it so many times when you’re young, like when you’re learning to play the guitar or whatever, all the meaning got sucked right out. AK: I don’t know enough about the history of the song and I don’t want to comment on what the original meaning might have been. I only know my experience of it and how I run into it and the emotions that it triggered in me and, for all I know, it could have been a very powerful song back in the 19th century.